The spiderweb of freeways, highways, and streets that crisscross through Los Angeles have become notorious for their state of disrepair. This means that millions have seen or heard that tiny crack noise from a loose pebble or small rock as it hits the windshield. PG Auto Glass Repair Los Angeles is now making it easier for these drivers to get their auto glass repaired or replaced with $10 discount on all services. When that small crack or chip occurs on the windshield, many drivers are hesitant about making that call to a Los Angeles auto glass repair company. The seemingly minor damage may appear to have ended after the initial crack. Unfortunately, things may take a turn for the worse down the road. Over the course of everyday driving and jostling, small nicks can become major cracks. Overnight, moisture in the air can find its way into damaged auto glass, expanding during the day and turning what may have been a minor problem into a life-threatening situation on the road. This is why PG Auto Glass Repair has positioned themselves to be the most reliable, affordable, hassle-free mobile auto glass replacement company. Their current $10 discount to certain glass repair services is an added bonus to their already competitive prices and unbeatable lifetime guarantee. After replacement, the auto glass will be as safe as the day that it was purchased. 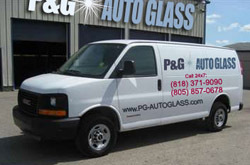 PG Auto Glass Repair Los Angeles also offers free estimates and a completely mobile repair service. Whether customers are in school, at work, or even relaxing at home, a PG glass repair specialist will be able to fix the damaged window on the spot with no towing or driving. Dealing with those small chips and cracks no longer has to turn into an expensive, all day project. The experienced staff of PG offer auto glass replacement in Los Angeles that is changing how drivers take care of their windshields. Their high-quality OE replacements will have residents back in their cars with a smile on their face.